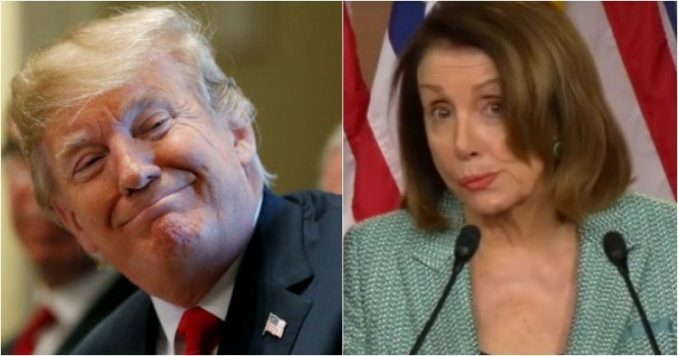 President Donald Trump called the Democrats bluff and stated he was “strongly considering” busing migrants into sanctuary cities like San Francisco — where Nancy Pelosi resides — as a prime destination. Well, that caused the Speaker to become incensed, giving an incoherent answer about any migrants headed her way. Don’t miss this. President Trump was rattling the Democrats on Friday, making it crystal clear he won’t back down on fixing the border crisis. Trump said he is seriously considering funneling detained illegal migrants into the self-declared sanctuary cities that oppose his tough immigration policies. “Due to the fact that Democrats are unwilling to change our very dangerous immigration laws, we are indeed, as reported, giving strong considerations to placing Illegal Immigrants in Sanctuary Cities,” Trump said during an impromptu press conference. “The Radical Left always seems to have an Open Borders, Open Arms policy –- so this should make them very happy!” Trump said. However, early in the day, officials at Homeland Security and ICE had rejected the idea. “Homeland Security and ICE lawyers quickly rejected the proposal, according to the people, and it was dropped on the grounds that it was too expensive and misuse of funds, two of the people said,” Breitbart reported. Well, Nancy Pelosi was taken aback when she was asked at a presser about Trump’s plan. The thought that she would return to San Francisco being overrun by migrants made the Speaker incensed. “Speaker Pelosi, we just ran a story saying that the White House is putting pressure on ICE to send undocumented migrants into Democratic districts including yours,” the reporter said, asking for a comment. What was that? We have no idea what she was trying to convey, but the leftist media quickly covered for the California Democrat. “House Speaker Nancy Pelosi says rounding up immigrants and shipping them to sanctuary cities is ‘disrespectful’ to the nation’s challenges,” reported Time Magazine, who didn’t want to quote the Speaker’s answer word for word, because it made no sense. Can you imagine if President Trump gave an incoherent answer like that? The Washington Post decided to quote Nancy’s spokesperson, bypassing the Speaker’s own statement. “Pelosi’s office blasted the plan,” reported The Washington Post. This isn’t the first time the mainstream media has covered for Nancy Pelosi. The 78-year-old Speaker has been in Congress for 32 years, but over the last year, in particular, Nancy has experienced increased instances of brain freezes. It has been much worse than just forgetting mid-sentence what she is saying and even much worse than rambling and making an incoherent remark. Well, we certainly hope President Trump has a big surprise for Pelosi when she gets back to San Francisco. Busloads of migrants right on her front own door would be a great start.